Feb 7th, 2019: I organised a workshop which hosted a delegation from The Netherlands. Many thanks to the group members to worked hard to make a very successful day! 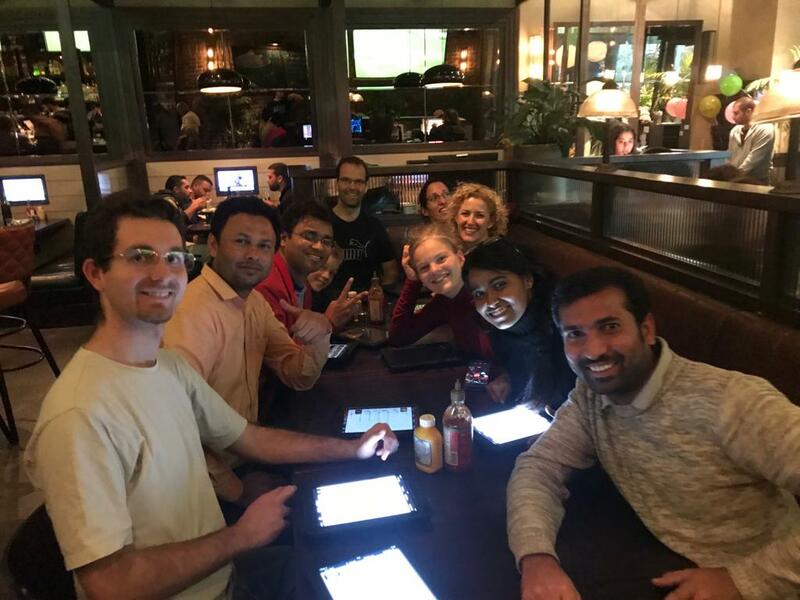 Feb 2019: We say good bye to Amit who finished his postdoc in my lab. He will continue his scientific career in USA! See pictures above of Laser tag and Dinner! January 2019: Congrats to Nitzan Kandiyote who published her 2nd article in Langmuir! January 2019: We say good-bye to Nitzan and Yaeli - Good luck in your future carreers! October 2018: We welcome Chidambaram Thamaraiselvan to the group! September 2018: Great time at laser tag. Thanks everyone! It was very fitting to play laser tag with so many people interested in laser-induced graphene! September 2018: Congrats to Nitzan Kandiyote who published her article in Langmuir! June 2018: (top) picture after group dinner in our backyard. May 2018: Swatantra Singh presented his research at the MELPRO conference in Prague. He won the student lecture presentation award! Congratulations! April 2018: We welcome Dyuti Banerjee to the group for her MSc research work. Good luck! April 2018: We welcome Abhishek Gupta for his postdoctoral studied and congratulate him for winning a BCSC fellowship! Mar. 2018: We welcome a new PhD student Mauricio Kleinberg, and Postdoc Amit Thakur: Good luck to both of you! Feb 2018: Congratulations to Canwei Mao who successfully defended his masters thesis! We wish you much success in your PhD in Switzerland! Oct. 2017: Welcome to new PhD student Yaeli Oren. Good luck! Sept. 2017: Canwei Mao went to the Wetskills challenge at the Technion and his group project won first prize! Great job Mao! Here is a link to the story! Above: Mao Canwei (Pictured far right) group winning first prize at the Wetskills Challenge (Sept. 2017).